I’ve never really gotten in to Father’s Day much. I always make sure to have plans for Mother’s Day, but Father’s Day is usually just me firing up the grill and drinking a beer. A few months ago, I sort of said in passing to J that I wanted a steak on Father’s Day. I sort of took the long way to Saugatuck a few weeks ago and took M-43 to M-40 to M-89 due to construction on Stadium Drive in Kalamazoo. Instead of just going to Main Street to get on the highway, I just drove two lane roads to get to our destination. On the way north on M-40, we passed The Grill House. I was hoping if I pointed it out, J would get the idea that I wanted to go there for Father’s Day. 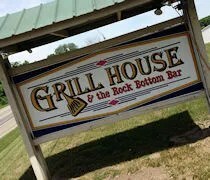 I actually first heard about The Grill House several years ago….while we were still living in Lansing. I was watching the 101 Tastiest Places to Chowdown on the Travel Channel when a place in the faraway town of Allegan popped up. I had no idea where Allegan was at that time….but I sure do now. On the Saturday before Father’s Day, J had told me she had gotten a reservation for noon on Sunday. I was excited…almost to the point I didn’t want to eat at all the day before because I just wanted to fill up on yummy, delicious steak. 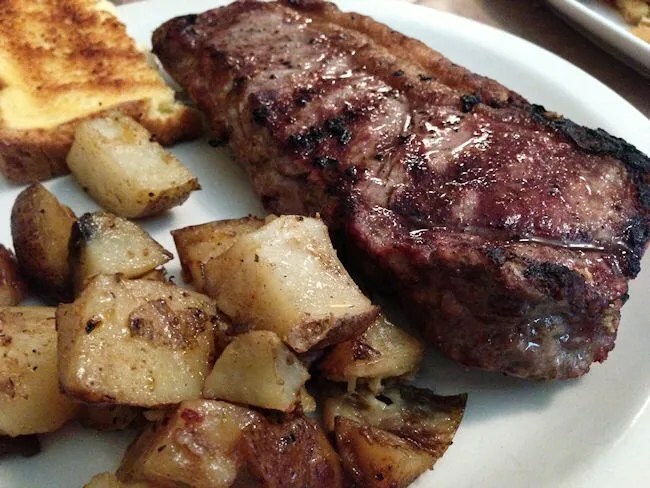 The Grill House is on M-40 (132nd Street) just south of the City of Allegan. 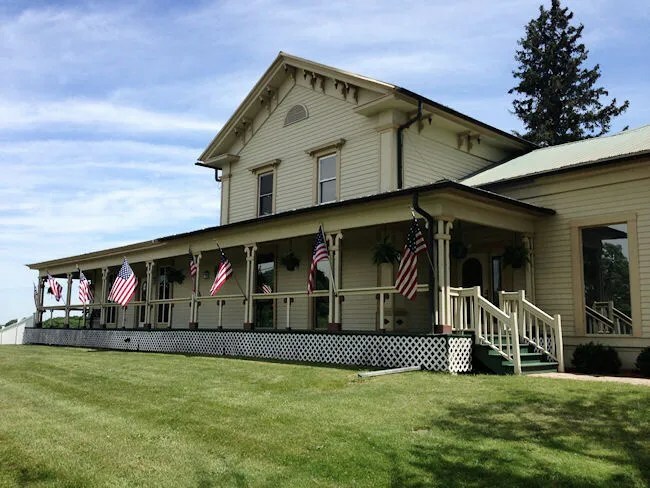 The restaurant is an old boarding house built in the 1830’s for lumberjacks. It’s been many things in the years since, but a little over a decade ago, the house transformed in to what is now a fairly unique steak house. We showed up for our noon reservation about fifteen minutes early. We decided to go inside anyway and see if we could get our table. The hostess had already set up our table up. We were right inside the door in the first dining room. We didn’t really look around much, but there appeared to be several different dining rooms set up throughout the first level of the house. There’s also a pretty awesome outdoor area that is a mixture of gliders and patio furniture. On the afternoon we were there, this was the only chance of getting a table if you didn’t have a reservation as the patio never takes them. Anyway, we were set up in the first dining room which was set up with smaller tables. Since it was just the three of us, they put us at a table for two and set up a high chair for L.
I’m not sure if this is everyday or just this day, but we had the option of ordering off either the grill menu or the pub menu. J told them in advance we were both going to order off the grill menu and the menus were on the table when we sat down. The grill menu isn’t very big. The focus is on the meats available in the grill room. In addition there are a few appetizers and a couple add-ons. We pretty much knew what we wanted, but we decided to take it pretty slow. We both started with drinks. I ordered a Fat Tire while J ordered a peach sangria. 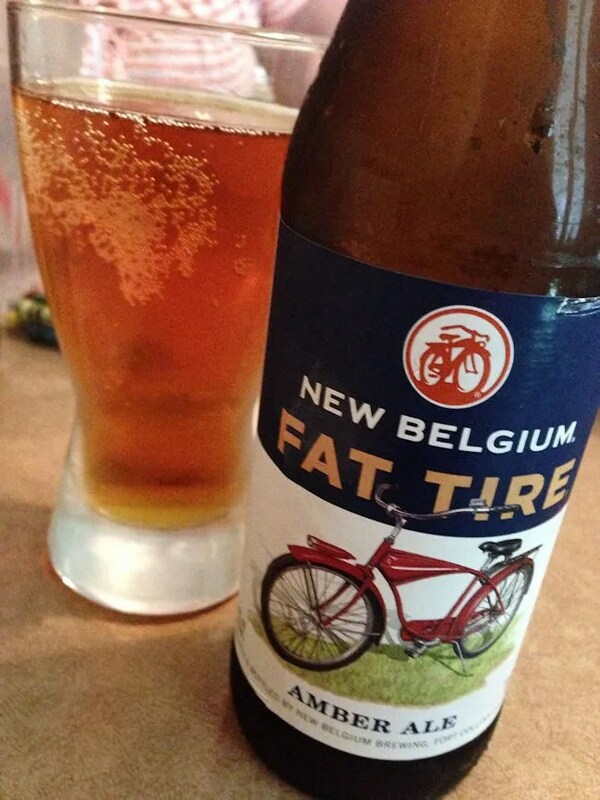 The Fat Tire was out of a bottle, but our waitress did bring a glass for me to pour it in to. In a totally unusual move, we decided to start with an appetizer. We ordered the Kettle Chip Nachos. 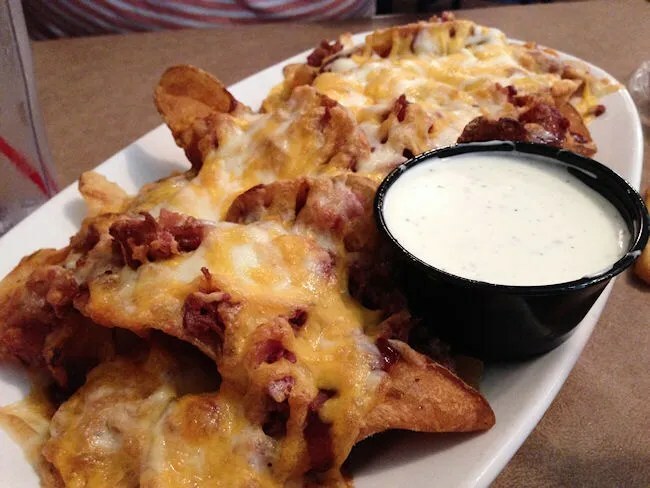 This large, shareable plates come with what appeared to be home made kettle chips, bacon, BBQ sauce, shredded cheese, green onions, and ranch. The plate would have been a meal on it’s own. J and I devoured these nachos. The chips were very crispy yet soft and flaky on the inside. The toppings were piled on top of the large mound of chips and all melted together with the cheese. At this point in the meal, I knew we were in for a good day. When the nachos came out, the waitress also brought out L’s meal. We ordered her chicken strips and fries. I’m really glad she did this. L was able to snack on them throughout our meal and by the time we were all done, she had eaten about two and a half of the strips and a handful of fries. Once we finished the nachos, the waitress then brought our salad. 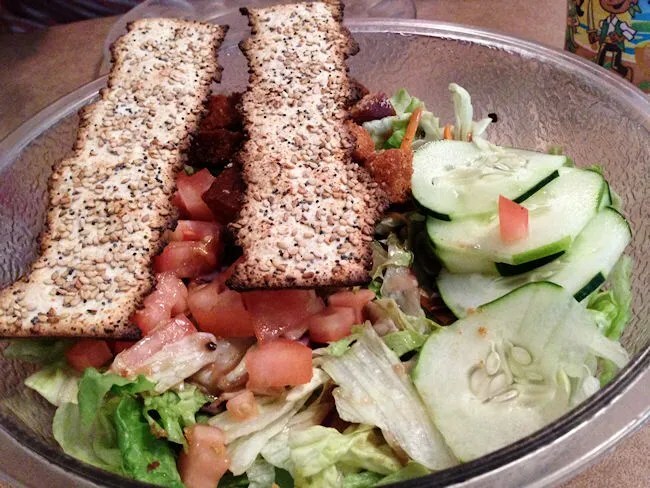 When ordering off the Grill Menu, the salad is included and served family style with a balsamic vinaigrette. The salad is simple with cucumbers, tomatoes, onions and croutons. The bowl was a little more than the two of us could eat, but it was a good palate cleanser and got us prepared for the main event. When we were done with our salads, our waitress came over and told us our space at the grill had opened up. She informed us we could bring our drinks if we’d like since we were going to be in the grill room for a little while. The Grill House is a “grill your own steak” place. It sounds kind of ridiculous, but this is the part of The Grill House I was really looking forward to. Could I have just fired up the grill at home and cooked a steak? Sure, but what fun is that? When you enter the grill room, there is a large case of meat waiting for you. The grillmaster goes over the selections for the days and once you decide what you want, the grillmaster actually pulls out the tray of meat and lets you pick which steak you want. You do actually have the option of letting the grillmaster cook for you, but again, what fun is that? I picked out a NY Strip and J picked out a chicken breast. They were handed to me on a tray then we were taken over to the grill and shown how to use it. 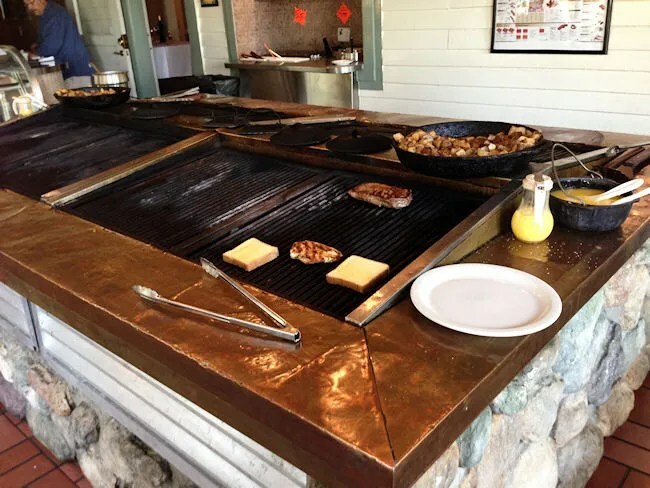 The grill is a combination of gas and charcoal. There are three distinctive zones of heat ranging from 700 degress down to 300. There’s also a wall of seasoning for prepping the meat before it goes on the fire. I grabbed Kosher Salt and a pepper grinder for my steak. I like to keep things simple. Salt and pepper make a great steak. For J’s chicken breast, I grabbed a BBQ rub. After everything was seasoned, I oiled up both pieces of meat and tossed them on the grill. I actually surprised myself a little here and cooked both pieces of meat exactly like I wanted. I got a good sear on the outside of both meats and got a perfect inside on them as well. J’s chicken was cooked through and was still soft and juicy while my steak was a perfect medium rare. It was pretty awesome to bite in to a piece of steak that has that incredible salty, peppery crust then a perfectly pink, juicy interior. There are a number of sides that come with the entrees in the grill room. On the grill are large cast iron skillets of cubed potatoes. I grabbed a pair of tongs and grabbed a little of them for each of us. The potatoes were a little under cooked for my liking with crispy outsides, but cubes were pretty large which left the interiors a little undercooked. 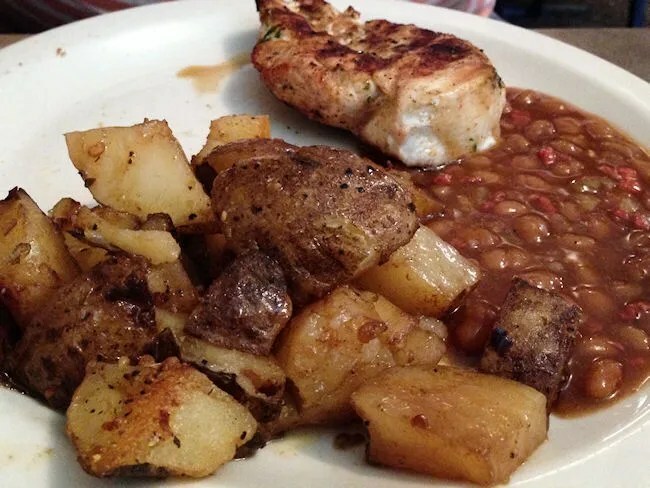 In addition to the potatoes, there are baked beans, baked potatoes and a large tray of Texas Toast that I buttered up and threw on the grill for a couple minutes….which made it delicious. Once we headed back to the table, the meal started going pretty quickly. Up until that point, it had been a nice, relaxing meal, but L was getting anxious and we were getting hungry. The meal was absolutely fantastic. It obviously didn’t take me very long to polish off my steak and J didn’t have much of a problem with her plate either. When we finally finished up, our waitress brought the check over which came out to only a little under $65. That price actually really shocked me as I thought it would be a little more expensive. We both left stuffed. Really stuffed. 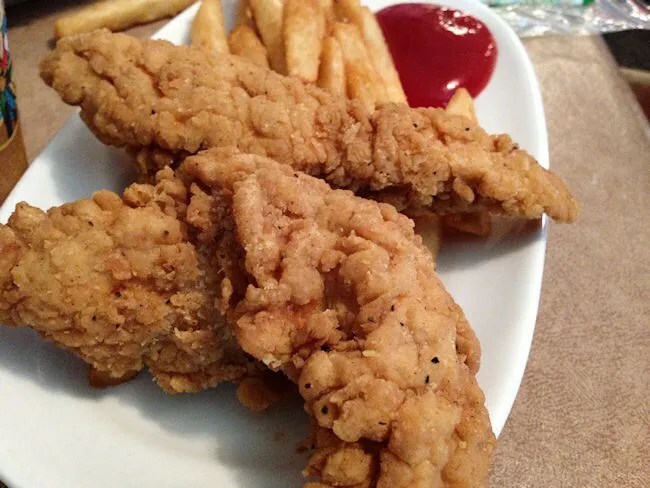 We don’t do steak houses very often, or at all, because it usually turns out to be expensive and we end up stopping at Wendy’s just to fill up. The Grill House was not like that. There is no way you can leave The Grill House and not be stuffed. I think by this point, I don’t even have to say it. We had a great Father’s Day lunch. I don’t typically ask for much nor do I expect anything, but I am extremely grateful that J made the reservation. I’ve wanted to try out The Grill House for several years and now that I finally did, I can say it lived up to my expectations.